Myoporum viscosum, the Sticky Boobialla, is a native of Victoria and South Australia. The Sticky Boobialla is a medium shrub that will reach a height of two metres. The leaves are up to 11 centimetres long by three centimetres wide, lanceolate to ovate, glossy and deep green with finely toothed margins. 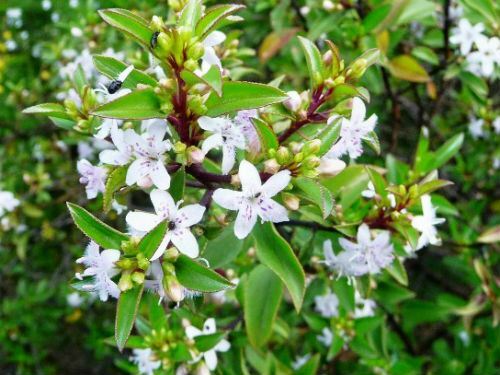 Flowers are about one centimetre across, white with purple spots. They are carried in clusters of from three to seven in the leaf axils. They appear in large numbers between June and November with sporadic flowering at other times. During the peak flowering period blooms are both conspicuous and profuse. Flowers are followed by purple, succulent fruits. Foliage and flowers are attractive features. Light pruning is appreciated. The plants, in our cold climate garden, have proved to be drought tolerant, frost resistant and free flowering. Myoporum viscosum would be an ideal hedge plant. Propagate from cuttings that strike readily but may take a little longer than other Myoporums.